Happy Birthday to my little brother, HiPie. He is fresh back from St. Thomas and St. Croix. He will definitively need a cocktail starter to replenish the scads of electrolytes he left behind. And we are having a dinner party with some friends tonight. One of them, born and bred in the Bayou. She is a fabulous cook thus inspiring this twist on a classic cocktail. We love a good bloody mary. My favorite bloody mary is actually from a mix called Zing Zang. Amazing. But this fruitful pleasure is a highly tasty version. Another way to stay refreshed while we still are wrapped in summer. Let's have a cocktail? Of course. This recipe compliments of Martha Stewart. 2. For children's drinks: Divide 2 1/2 cups juice among 4 ice-filled glasses. 3. For adults' drinks: Stir remaining 3 cups watermelon juice with tomato juice, hot sauce, Worcestershire sauce, salt, and celery seeds in a bowl set in a larger bowl of ice. Season with pepper. 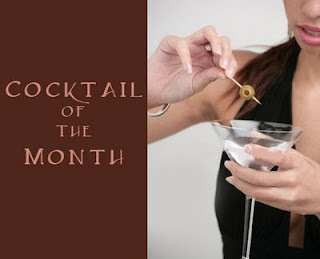 Stir in vodka and divide among 4 ice-filled glasses. 4. Garnish adult drinks with a piece of watermelon and a celery stalk. I feel whoozy just reading the recipe & looking at the pic! Have a great evening! We'll probably be hearing more...! I love me some bloody mary, but I must say I am mamaw about giving this watermelon a go in my mary. I do like different though. Will let you know when I give it a whirl! Yum. 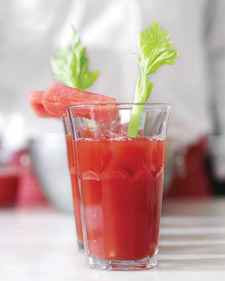 I love Bloody Marys...especially at those early morning football tailgates! I recently made a watermelon gin and tonic from a recipe I got from Cooking Light. Watermelon really adds good flavor without being too sweet (surprisingly). Interesting. I don't know how I feel about adding watermelon to tomato-y goodness of a mary but I am willing to try anything once! But I suppose yoiu can add vodka to anything and it'll turn out good! I absolutely love watermelon! I may have to try the kids version so I don't tarnish the watermelon flavor. But I know a few adults that would love the other version. Hi. Visiting from SITS. Happy Saturday Sharefest. I don't think I've ever had a Bloody Mary, but this sounds good. Bloody Marys are wonderful, I have never tried it like this though and I'll have to. Mmm..who would of thought watermelon with the other ingredients but I bet this is fabulous. And, when your drinking this you'll know you have your fresh fruit for the day..lol! That's really interesting... I don't drink, but I have never heard of watermelon in a Bloody Mary before! I hope your dinner party is fabulous! I would never think to blend watermelon with tomato juice but who would have thought I would like cuke, grapes and vodka either..
Will give it a go..thanks. Sounds scrumptious and like something I need to try! There's tons of summer left here in south Texas. I dislike both watermelon and tomato juice but the picture is nearly convincing me to try. Have a great time time with bro. This sounds perfect! I need two now! Ooh, looks delish! I've been struggling to love Bloody Mary's for years - wanting to be THAT girl and all. Recently, I had the first that when I finished, I wanted to order another. I'm so there. BTW, if you have a sec stop back by this weekend. You beat me to it before I posted (the dog needed walking) but it's a good (and short) one today. So different, sounds amazing. I will test this one out next time i have friends over. Thanks for the recipe! LOL...I think this recipe is awesome. My husband just looked at it and said, "Leave the bloody mary alone, Martha." I can't handle the spicy! However my husband would love this. In fact he's a little ornery right now, he definitley could use a cocktail! Or three. This sounds so wrong....but I bet it tastes so right. looks very good to me! will serve for thanksgiving! I always wonder why its called bloody mary. But happy Birthday to your brother! I once heard about a wheat beer that was infused with watermelon. I always wanted to try it, because I felt like, if there was a way to bottle "train wreck", that would be it. But, now I can't. So, I won't get to try that. The point here is that I think watermelon goes better in your mix than the one I described above. i'm back to let you know i gave you a Cupcake Award! please grab from my sidebar! cheers! I don't know if I can get behind watermelon and tomato mixed together. . .
wow..... this is up there with the Earl Gray Goose that my husband's friend is trying to prefect. I will keep you updated. Earl Gray flavored Vodka we will see. I do not like like tomatoes at all so maybe I will just throw some watermelon and vodka together and call it good. Yum! Thanks for sharing. I'm going to try this very soon. Sounds like an interesting combination, I'll have to give it a try sometime. I actually prefer the Caesar over the Bloody Mary, there's just something about Clamato juice that I can't get enough of it! Dude. You just made my day. I am all kinds of obsessed with bloody marys!